The Supreme Court today issued notice to the Centre on a petition filed by ex-servicemen which sought implementation of One Rank One Pension “as formulated by” the UPA-2 government saying the present government had diluted the policy. The petitioners are being represented by veteran lawyer Ram Jethmalani and advocate Balaji Srinivasan. The bench headed by Justice Dipak Misra has sought Defence Ministry’s response within two months. OROP is the uniform payment of pension to ex-servicemen who retire in the same rank with the same length of service irrespective of their date of retirement. It also involves any future enhancement in the rates of pension for recent pensioners being automatically passed on to the past pensioners. This definition has been approved by the Defence Ministry on February 26th 2014, said the petition. “Most shockingly, despite report of the Koshiyari committee and the decision of the SC in Union of India Vs SPS Vains, the government delayed the implementation of the OROP in utter violation of the constitution and rule of law. Further, it is also attempting to create “one rank different pension” by proposing to pass any future enhancement in the rates of pension, to the past pensioners on a periodic basis (as opposed to automatically and contemporaneously). Effectively it is proposing to continue with one rank different pension as past pensioners will draw lesser pension than ex-servicemen who retire junior in rank, if pension enhancement benefits are not passed on automatically to past pensioners”, it said. The ex-servicemen moved the court after a 320 day protest at Jantar Mantar in the national capital. 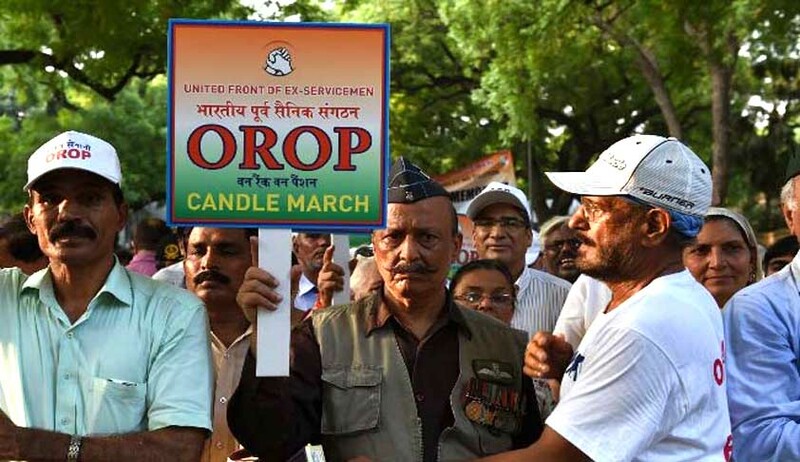 Defence Minister Manohar Parrikar had in September last year announced implementation of the long delayed OROP for ex-servicemen but the veterans have been continuing with their protest demanding “complete” implementation of the scheme.